Today’s economy is more “on-demand” than ever. From entertainment to food delivery, consumers are led to believe they can get anything, anytime, anywhere at the push of a button on their mobile phones. The impact on customer service has been enormous, as people want the information they need or their issues addressed in an incredibly short span of time. How would the bot provide consistent answers when their live agents struggled to do so today. In her example, the customer support agents would put calls on hold or practically ignore ones in the queue because of a heavy backlog. To handle calls successfully, agents had to figure out which internal system produced the best answer for a customer question. Their digital channels were an afterthought. be available for instant communications with customers. Bots do these two things bots quite well today: provide a consistent voice for the brand and offer instant support for the customer. The result for customer service, support, and care is that consumer expectations are higher than ever. If people don’t get the answers they need right away, they’re likely to switch over to a competitor. In fact, Microsoft’s 2016 Global State of Customer Service Report indicates that 93% of consumers think customer service is a key factor in determining their loyalty to a brand. Digital channels will carry even greater import. Digital channels will be the future starting point for most customer care interactions. Over 50% of customers now believe they should be able to resolve their issues on their own, without relying on a live customer support agent (according to a study conducted by Zendesk). In another survey, Harris Poll found that 64% of customers would rather text than call a business. Bots can thrive in this environment, we’ve seen this first hand at Azumo where more purpose oriented bots have realized significantly more engagement, regardless of digital channel. The increasing reliance on self-service reflects rapid growth in digitally savvy users. These people have grown up communicating and accessing data over the internet. They see self-service as the most time and cost efficient method of solving problems. To provide rapid (yet still personalized) service, chatbots can be particularly revolutionary. At their heart, bots are just computer programs that mix NLU (natural language understanding) with intelligently designed pointers that can simulate human conversation to get tasks done. If someone sends a customer service inquiry via SMS messages, for instance, a chatbot can interpret the messages and come up with an immediate response that is likely to address the issue. Some even predict that by 2020, 85% of all customer service interactions will be managed by non-human technologies like chatbots. Today, we’re at an inflection point for chatbot technology. 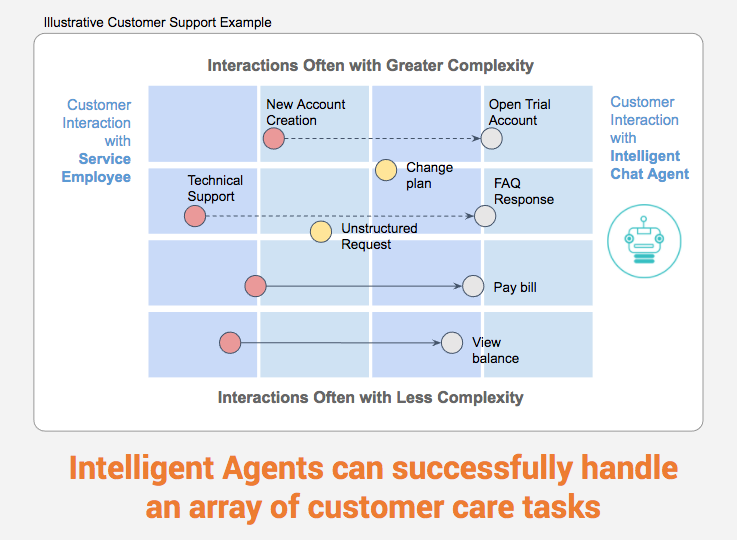 Adoption, innovation, and customer acceptance of intelligent agents is increasing. Both businesses (and customers!) are recognizing the value of these quick, effective customer service and support interactions. Companies can phase in the use of bots as a way to support existing customer support processes, and achieve quick (and long term) ROI wins. For the bank or any other customer thinking through customer service, bots represent a way to augment existing efforts.